We want to hear from you! The district provides opportunities for stakeholders to provide feedback on parental involvement activities and how you would like to see the district align and prioritize spending of its resources. The 2018-19 final approved Local Control Accountability Plan for the Monterey Peninsula Unified School District reflects the goals, objectives, measurable outcomes, and actions and services the district will engage in during the 2018-19 school year. The Local Control Accountability Plan (also referred to as LCAP) is Monterey Peninsula Unified School District's three-year plan outlining the allocation of state funds provided to school districts to improve learning for all students, and supplemental funds devoted to help students from low-income families, students who are learning English as a second language, and foster youth. Stakeholder Engagement (a stakeholder is defined as someone who is involved with, interested in, employed or affected by MPUSD. Stakeholders may include certificated or classified staff, students, parents, community members, business leaders, elected officials. The Local Control Funding Formula is California's formula for determining the level of state funding provided to school districts. The funding, also referred to as supplemental and concentration funding, helps to improve learning for all students, and supplemental funds are devoted to helping students from low-income families, students who are learning English as a second language, and foster youth. You input is always welcome. 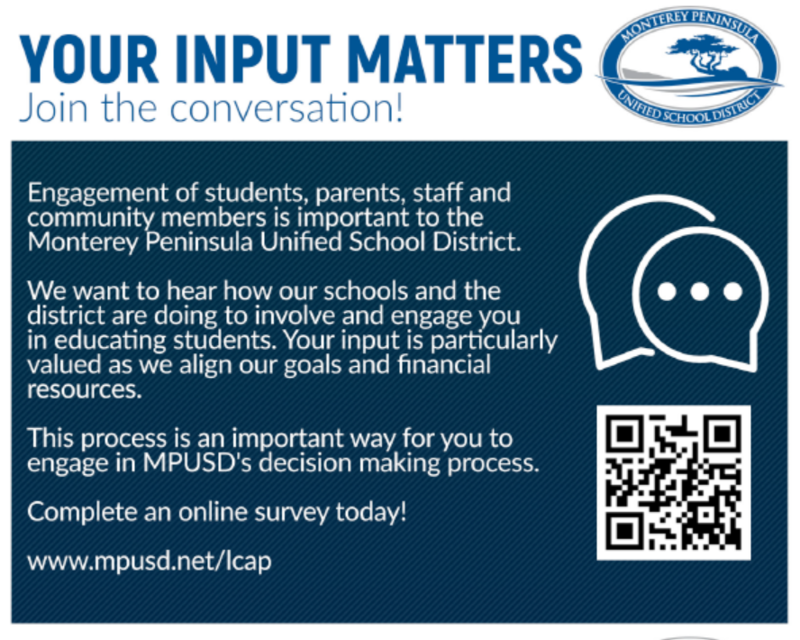 If you have comments or feedback, you may contact Marci McFadden, Chief of Communications at mmcfadden@mpusd.net or 831.706.6971.